With the S&P 500 having moved higher for a third consecutive week and now sitting 9.3% above the February 11, 2016 low, it is fairly easy to argue that the worst of the bear market may be over. The bulls will go even farther, suggesting that we've already seen the low of the bear market and that the recovery process has begun. As such, it would seem to be a very good time to check in on our major indicators in order to see if either team has the edge here. But first let me remind readers that with the exception of our "Leading Indicators Model," none of the indicators/models we are about to review are designed to be predictive in nature. The approach I take to the markets isn't about predicting what the market is going to do next. History has shown that no one - repeat, NO ONE - has been able to consistently predict what Ms. Market is about to do for any real length of time. Sure, there have been some great "calls" by some gurus over the years, but most have wound up being one-hit wonders. To review, the goal of the approach I employ is to get it "mostly right, most of the time." The idea is to avoid the big mistake in the markets. Put another way, we want to try and stay on the right side of the really big, really important moves in the markets. Therefore, the indicators and models we employ are not designed to be "timing" oriented. They will rarely, if ever, sell the top and/or buy the bottom of big moves. No, the idea is to have models that will "confirm" what is actually happening in the market. To be sure, such an approach isn't flashy and will never land us any major media coverage. However, the goal is to add value to the markets over the long term by reducing exposure to the markets when risk factors are high and to stay mostly invested when the risk factors are low. First, let's take a look at the near-term price action via a daily chart of the S&P over the past year. The first item of note here is that stocks have really gone nowhere for quite some time as the S&P currently stands about where it was in the summer of 2014. In the category of restating the obvious, it is now clear that the bulls have embarked on a spirited move over the past three weeks. The good news is that the S&P broke above the first key resistance level at 1940 last week and has since put a fair amount of space between it and that important line in the sand. This suggests that there may be "real" buying going on at the present time. I.E. Something more than the usual intraday millisecond trend following blasts that tend to move the market a few percent before reversing. Next, we should note that the next test for the bulls isn't very far away. Although chart analysis can be more art than science, we see that there is (a) a key Fibonacci retracement level sitting at the 2000 mark, (b) key intermediate-term resistance in the 2020 zone, and (c) an intermediate-term downtrend line currently in the vicinity of 2030ish. Thus, the going may get tougher for the bulls in the next week or so. Okay, enough of the chart watcher stuff. Let's move on to the indicators, which are driven by math instead of subjectivity. 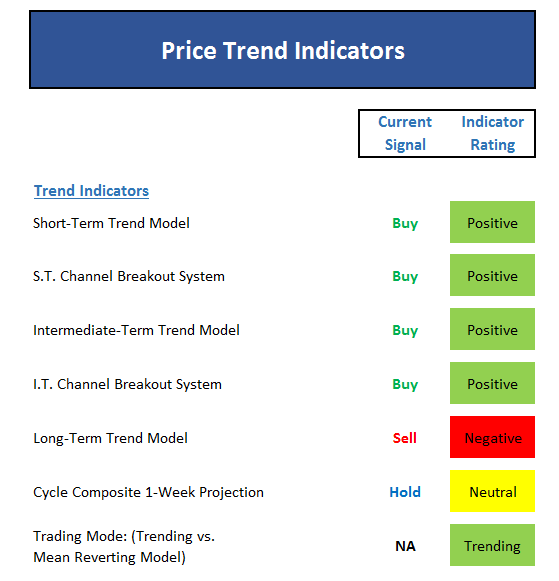 First up are a group of indicators/models that focus on the price action of the market from both the short- and intermediate-term time frames. As I've mentioned in previous editions of this exercise, the first thing to do is look at the color of the boxes. And the bottom line is there is an awful lot of green in this set of indicators/models. In fact, the only two indicators that are not positive at this time are the weekly cycle composite (which projects a modest advance this week and then good gains the two following weeks), and the long-term 200-day, 50-day crossover indicator. In short, these models confirm what we see on the charts - prices have improved in a meaningful way. The question, of course, is whether or not the current joyride to the upside is anything more than a bounce within an ongoing bear market. For clues on this issue we need to move on and look at the market internals, external factors, and our primary big-picture cycle models. 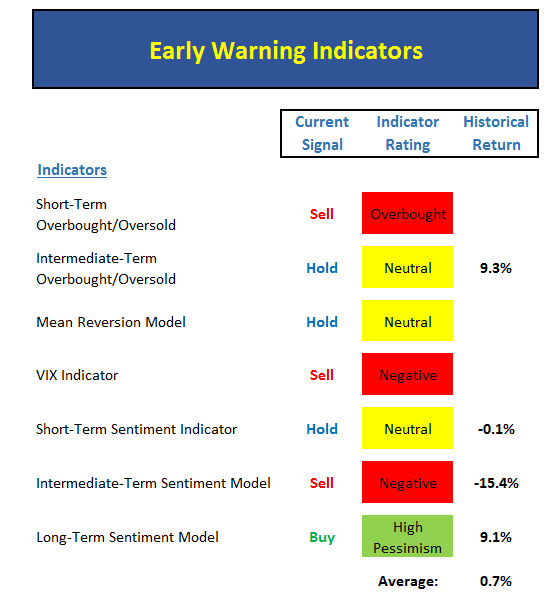 But first, with price having run very far, very fast, let's look at the "early warning indicators" to gauge if a pullback might be in order in the near-term. 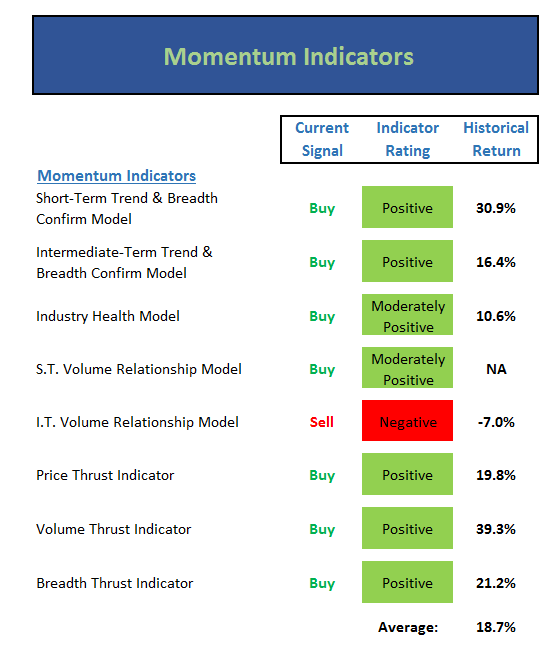 Not surprisingly, these indicators/models suggest that the market is indeed overbought from a short-term perspective and is close to becoming so from an intermediate-term basis as well. The only positive on the board here is the longer-term sentiment model, which tells us that there was an extreme level of pessimism seen during the depths of the decline. However, with the short- and intermediate-term sentiment indicators neutral and negative respectively, we should conclude that the sentiment winds are no longer at the bulls' back. This situation is also confirmed by the average historical return from this batch of indicators, which currently stands at just +0.7% per year. Thus, it is easy to suggest that a modest pullback is likely in the near-term. Given the veracity of the recent bounce, it is not surprising to see a lot of green here. Perhaps the most notable improvement can be seen in our Industry Health Model - aka my "desert island" indicator. The only holdout in this group is the long-term volume relationship model, which remains solidly in the red. The key here is to recognize that supply volume dominated demand volume during the decline. And the extreme negative reading tells us that there was significant damage done to the internals. My takeaway is this indicator is a gentle reminder that all is not (yet?) 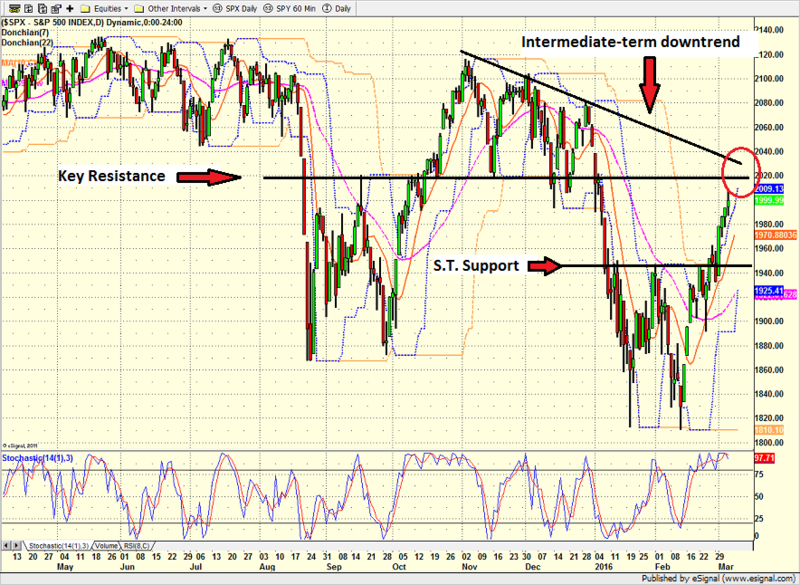 well from the technical health perspective of this market. But with the historical average annualized rate of return reading for this group of indicators currently nearly double the buy-and-hold return of the stock market, the bottom line is that momentum is pretty decent at this stage. My main concern at this point regarding both the price and momentum indicators is the fact that the character of the market has clearly changed over the past few years. The bottom line is algorithmic trading now dominates the game on a daily basis. As a result, moves that once took days now occur in hours. Moves that used to take weeks, now take place in a day or two, etc. Because of the abundance of outsized moves that occur on a daily basis, most shorter-term price and momentum indicators have been "fooled" by the near-term price action on a consistent basis since the beginning of 2014. Thus, my fear is that this time will be no different. So, given that price and momentum indicators have displayed a propensity to get fooled lately we need to move on to a review the external factors that have historically driven stock prices and my favorite longer-term models. But since I've already rambled on long enough for one morning, we'll save a review of the bigger picture stuff for tomorrow. The big news overnight comes from China where the government announced its official forecast for the rate of economic growth for 2016 to be a range of 6.5% - 7.0%. In addition, Beijing is looking for the rate of inflation to be in the 3% zone for the year. Stocks in Shanghai cheered the news with a modest gain, however the rest of the globe appears to be starting the week in the red. Concerns about "policy divergence" is back this week as another strong jobs report in the U.S. suggests the Fed will continue to raise rates while the ECB is widely expected to present more stimulative measures when it meets this week. Despite oil moving higher again this morning, stock markets in Europe are lower and U.S. futures point to a pullback at the open on Wall Street.